(Salt Lake City) Utah taxpayers who save for higher education expenses with the Utah Educational Savings Plan (UESP) can qualify for a tax benefit in 2016. If they meet certain year-end deadlines, Utahns filing individual returns and Utah trusts can claim a 5 percent Utah state income tax credit for 2016 on contributions up to $1,900, for a maximum tax credit of $95 per qualified beneficiary. Joint filers can claim a 5 percent tax credit on contributions up to $3,800, for a maximum tax credit of $190 per qualified beneficiary. Utah corporations can qualify for a $1,900 state income tax deduction. A grantor trust whose grantor has joint filing status can also claim a 5 percent tax credit on contributions up to $3,800 (a maximum tax credit of $190) per qualified beneficiary. Any contribution, up to the allowed maximum, that a UESP account owner makes to an account for a person who was age 18 or younger when designated as the account beneficiary qualifies for the 5 percent Utah state income tax credit or deduction. For example, a Utah account owner who contributes $100 to a UESP account in 2016 may claim a $5 credit. A $1,000 contribution qualifies for a $50 credit. A couple filing jointly who contribute $3,000 are eligible to claim a $150 tax credit. Plus, if a friend or family member contributes to an account, the account owner can claim that contribution for the tax credit. To qualify for the 2016 Utah state income tax benefit, UESP account owners who pay Utah state income taxes must submit their contributions by mail, or deliver them by overnight carrier or in person to the UESP office before 5:00 p.m., Mountain Time (MT), Friday, December 30, 2016. The deadline for contributions made online at my529.org is 11:59 p.m., MT, Saturday, December 31, 2016. New UESP account owners who pay Utah state income taxes must submit their new Account Agreements and contributions by mail or deliver them by overnight carrier or in person to the UESP office before 5:00 p.m., MT, Friday, December 30, 2016. 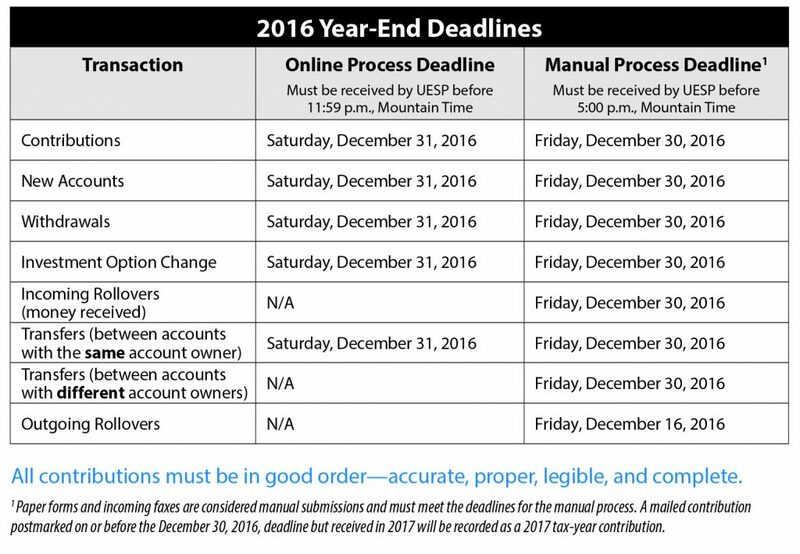 New Account Agreements also can be faxed to UESP, and must arrive before the 5:00 p.m. deadline on December 30, 2016. New accounts opened and contributions made online at my529.org must be completed before 11:59 p.m., MT, Saturday, December 31, 2016. In addition to the Utah state income tax credit, earnings on UESP accounts grow tax deferred. Withdrawals are free from federal and Utah state income taxes when used for qualified higher education expenses. Qualified expenses include tuition and fees; required books, supplies, and equipment; computers, related equipment, services, and internet access; and certain room-and-board costs at technical schools, colleges, and universities in the United States and abroad that participate in federal financial aid programs for students. UESP, Utah’s official nonprofit 529 college savings plan, is highly ranked by Morningstar Inc., Kiplinger’s Personal Finance magazine, Money magazine, CBS MoneyWatch.com, and consumer expert Clark Howard for its low fees and industry innovations, such as its customized allocation investment options.